← The one thing I love about McDonald’s … besides the fries. Maine is one of two states I’ve never been to — until yesterday. And I have to tell you, it looks just like it’s supposed to — totally picturesque and cute. 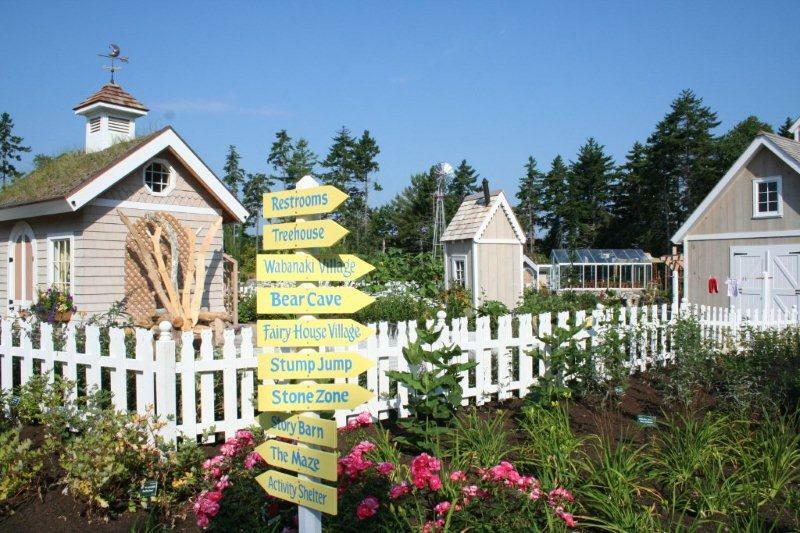 But I was especially lucky to make it just in time for one big day for the Coastal Maine Botanical Gardens —as the fabulous, two-acre Bibby and Harold Alfond Children’s Garden opened its storybook doors.And I mean that quite literally. 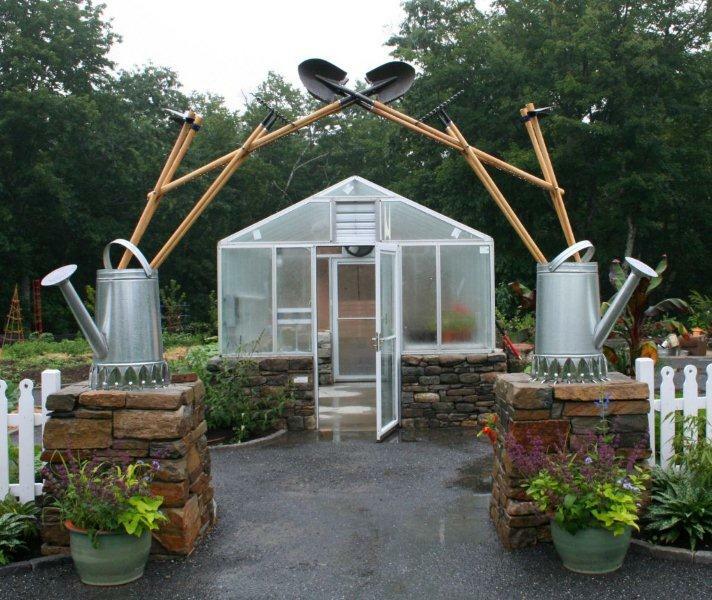 The concept for this imaginative, beautifully conceived garden is based on children’s storybooks that were written by Maine authors (and there are a wild cluster of them, from E.B. White to Robert McCloskey) or set in Maine (think Blueberries for Sal). 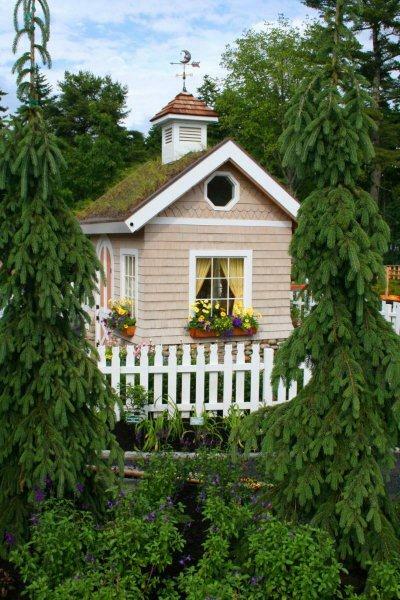 And all the plants, mazes, gardens, buildings and artwork in the Coastal Maine gardens are as charming and captivating for adults as for children – the hallmark of a perfect children’s adventure in my book. Everywhere on the two acres, kids can explore their little hearts out…outside. What a concept! This isn’t low-tech, it’s a no-tech wonderland with a lake, two islands, rope swing, binoculars for birding, stump jump, and a Fairy House Village where you can build tiny domiciles with non-living materials like acorns, bark, leaves, and twigs from the Gnome Depot. There are also goldfish to watch, frogs to marvel at, and chickens to feed if plants and trees are just too inanimate. The tool arch - Arc de Triomphe eat your heart out! 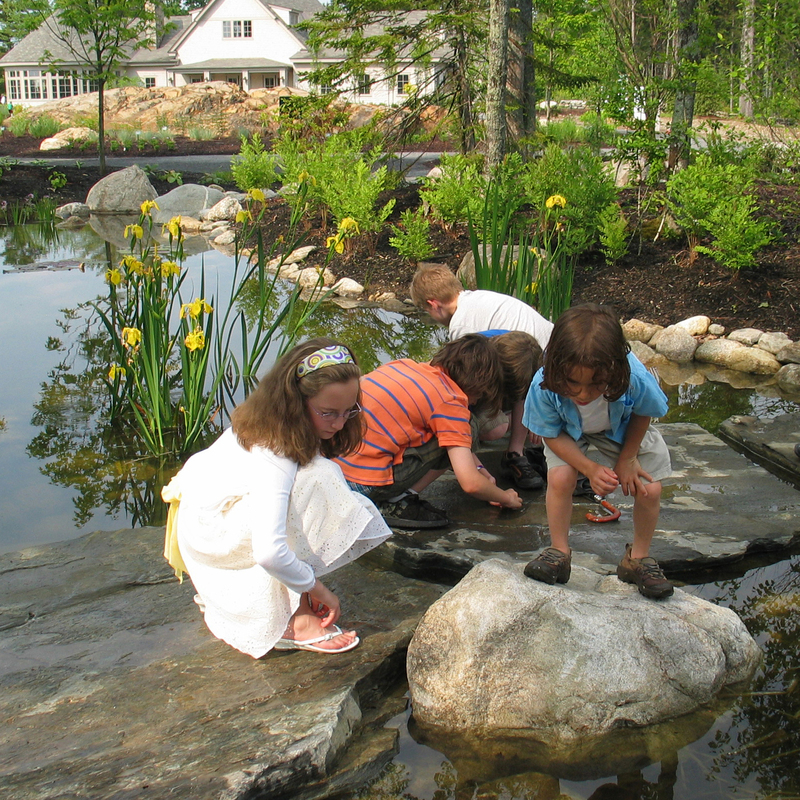 All in all, the spanking new Children’s Garden is a perfect marvel – much like the Coastal Maine gardens themselves. Stretching across 248 acres and a mile of waterfront in Boothbay, this is Maine’s first and only botanical gardens—dropped like a seed in 1991 among a few passionate garden fanatics who searched up and down the coast for suitable property before discovering this land that had been slated for development. 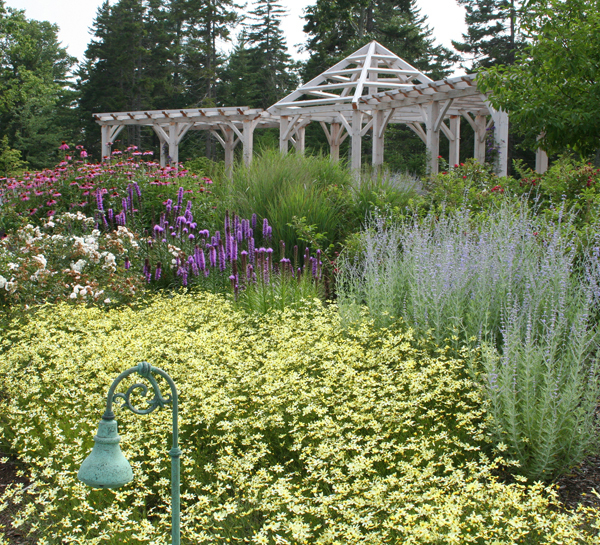 In 15 years, they’ve created stunning ornamental gardens, laced with impeccable Maine stonework, miles of trails running from waterfront to woodlands, an enviable education center, notable Kitchen Garden Café, and enticing Gift Shop. “It’s a really elaborate and elegant place – in a nice, quiet Maine sort of way,” explains Barbara Freeman, Director of Communications. Gosh, I couldn’t have said it better myself! 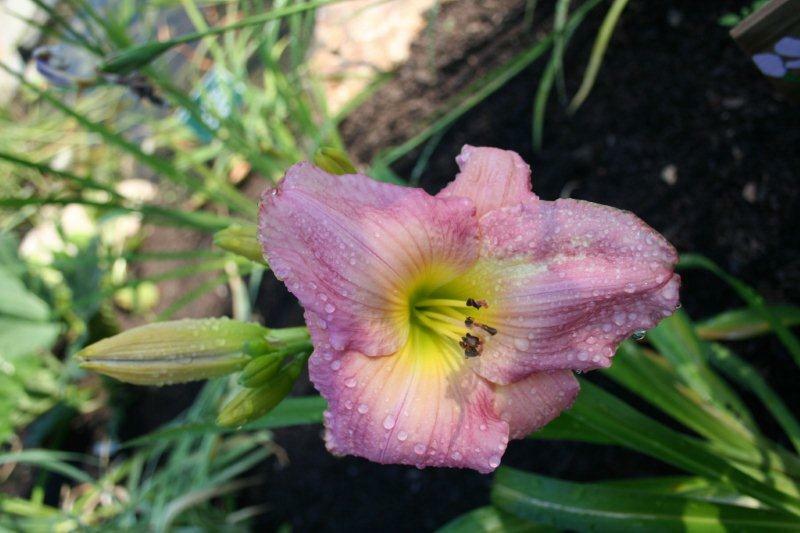 To join me in supporting this green, glorious garden (as I said before, it’s my very first trip to Maine and I’m totally smitten), click here! We could have had lunch – I was in Camden on Thursday which is an equally spectacular coastal town! We were spending our annual week at Belgrade Lake where the Alfonds have a compound a few camps down from our friends. They are very generous with their support for the Belgrade Conservation efforts and they set off some awesome fireworks! The garden looks amazing so I’ll put it on our tour list. Sounds (and looks – great pix) perfectly lovely! I didn’t realize so many children’s authors came from Maine. Betty – Thanks for a wonderful glimpse of Maine. I’ve never been there, but I’m smitten too! It looks amazing, and not just for kids. In fact, I think my wife and I will visit the next time we’re in Maine. Thanks for the discovery!